A high-level U.S. diplomat called for the release of political prisoners and detained student activists during a meeting with Myanmar political leaders on Monday to discuss the upcoming political power transition following last year’s landmark elections. U.S. Deputy Secretary of State Antony Blinken met with opposition leader Aung San Suu Kyi, whose National League for Democracy (NLD) party swept general elections in early November, as well as incumbent President Thein Sein. Blinken also met Vice Senior General Soe Win, who is deputy commander-in-chief of defense services, and Foreign Minister Wunna Maung Lwin in the capital Naypyitaw to discuss the country’s transition to democracy. He urged Thein Sein’s quasi-civilian Union Solidarity and Development Party (USDP) government to free all remaining political prisoners before the new NLD government is formed in March. Although the president has released some prisoners as part of the country’s reform process, many others remained jailed, including some of those sentenced under the military junta that ruled Myanmar for five decades until 2011. “It would be a fitting completion of that legacy [of reform] to release all political prisoners so that by the time the transition is complete and the new government takes office, no one is in prison for their political views,” he said. 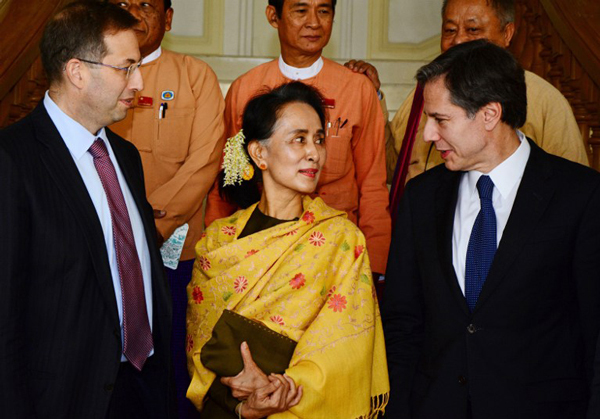 Blinken also called on the government to protect human rights for all people, no matter their ethnicity or religion, referring to the ethnic Rohingya Muslim minority group that predominantly lives in western Myanmar’s Rakhine state. “As progress is made, we hope that the focus in Rakhine state can turn to overcoming challenges, underdevelopment, and social division that are holding back all the people in the state,” it said. Myanmar’s government views the Rohingyas as illegal immigrants from Bangladesh, even though many have lived in the country for generations. Some 140,000 Rohingyas, who were displaced during communal violence with ethnic Buddhists in 2012, live in squalid camps in Rakhine state, while thousands of others have risked their lives at sea in an effort to flee persecution in the Buddhist-dominated nation. Blinken also urged the government to release student activists jailed during a peaceful demonstration against a controversial education law last March in the central Myanmar town of Letpadaung. Nearly 130 students and their supporters were arrested following a violent police crackdown on the demonstrators. More than 60 of them remain in prison awaiting trial. Blinken said the U.S. expected closer relations with the incoming NLD government and that the country was committed to supporting Myanmar citizens in their pursuit of democracy, development, and national reconciliation. “Since 2012, we have provided more than $500 million in support of Myanmar’s reform process, including implementation of the Nationwide Ceasefire Agreement and efforts to increase the participation of civil society and women in the peace process,” he said. The current government signed a so-called nationwide peace accord with eight of the country’s armed ethnic armies last October. Aung San Suu Kyi said last week during a peace conference in Naypyidaw that the NLD government would work hard to build peace with separatist ethnic armies left out of the agreement. “Reforms need to continue until an elected civilian government is truly sovereign, and all the country's institutions answer to the people,” Blinken said. “The United States will work in close partnership with the new government to support its efforts to achieve these goals. Blinken’s tour of Asia is also taking him to Beijing, Seoul and Tokyo to consult with U.S. allies in the region, hold interim Strategic Security Dialogue talks with the Chinese government, and discuss regional and global issues, according to a State Department release. Reported Win Naing for RFA’s Myanmar Service. Translated by Kyaw Min Htun. Written in English by Roseanne Gerin.